From fast drying to beautiful styling. Elevate your styling experience. 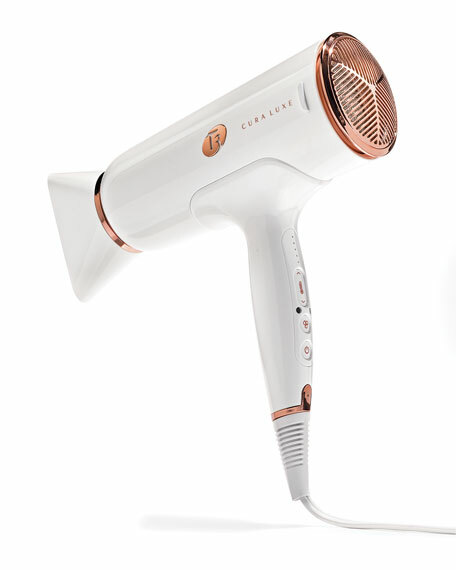 Powered by T3 Digital IonAir technology and innovative new features, the T3 Cura LUXE dries hair quickly with soft, healthy-looking results. Elevate your styling experience with T3 Digital IonAir, multiple heat and speed settings, a Volume Booster switch and an Auto Pause Sensor. Innovative Digital IonAir technology combines digitally-controlled heat with a wide, gentle airstream to dry hair quickly while maintaining body and shine. With a powerful built-in ion generator, negative ions smooth the hair cuticle for soft, frizz-free results. 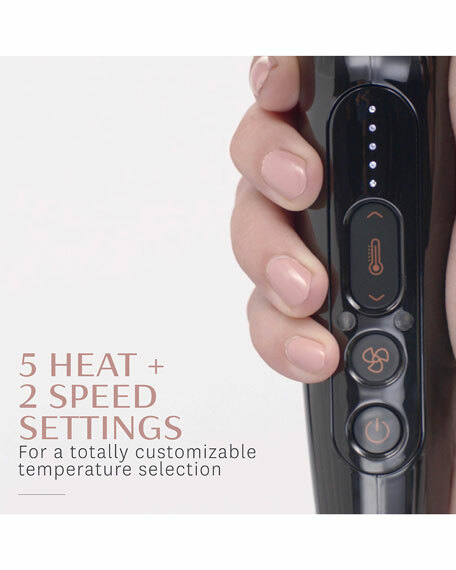 5 heat and 2 speed settings combined with a lock-in cool shot button to create customized settings for any hair type and texture. 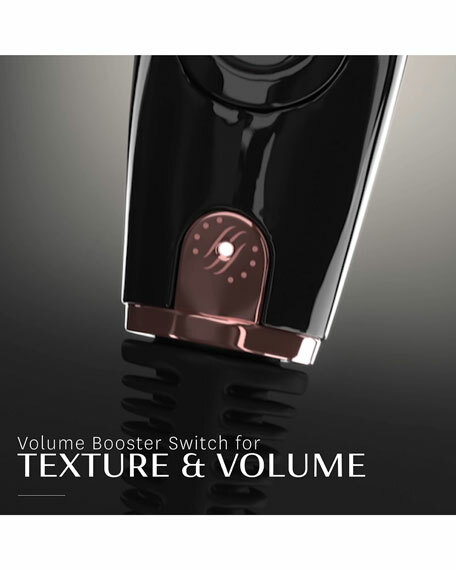 The Volume Booster switch allows you to deactivate the ionizer to boost texture and volume,* while the Auto Pause Sensor intuitively pauses airflow when you release the dryer handle to make your styling routine effortless. Other features include: Ergonomic Handle, Lightweight & Quiet; Pure Stream Filter Cap; Long Life Motor; Drying Concentrator; Styling Concentrator; 9ft. Cord With Wrap; 2-Year Warranty *Results may vary by hair type. Precise, digitally-controlled heat combines with a wide, gentle airstream to expertly dry hair quickly while maintaining body and shine. With a powerful built-in ion generator, negative ions smooth the hair cuticle for soft, frizz-free results. 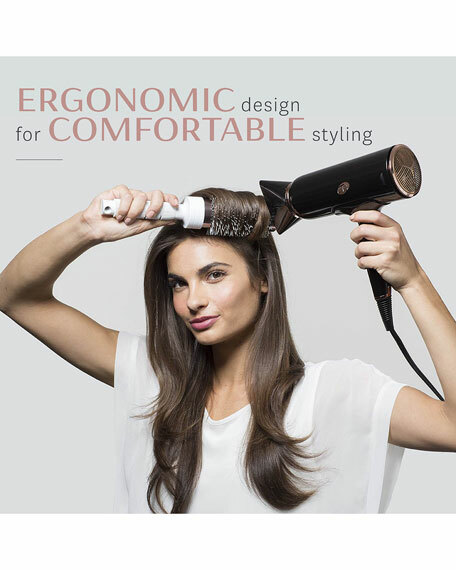 T3 Digital IonAir Technology: Digitally-controlled heat that dries hair quickly while maintaining body and shine. 5 Heat & 2 Speeds Settings: Offer styling customization for all hair types and textures. 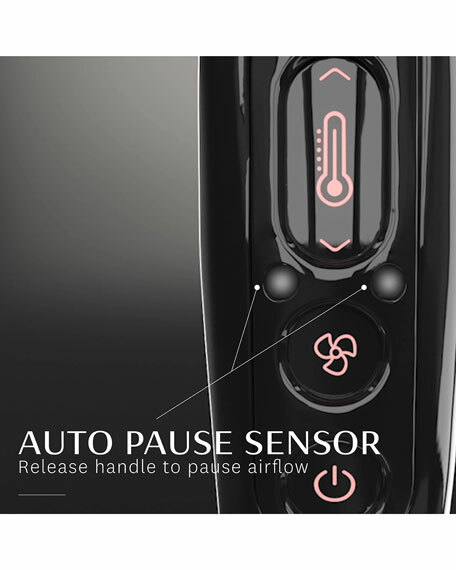 Auto Pause Sensor: Intuitively pauses airflow when you release the dryer handle during styling. Lock-in Cool Shot Button: A burst of cool air locks in any style for a smooth, sleek finish. Lightweight & Quiet: Weight-balanced design and quiet operation for a luxurious drying experience. Pure Stream Cap: Removable filter for optimal performance. Long Life Motor: Ensures a reliable performance. Drying Concentrator: Dries hair evenly and quickly with a wide volume of air. Styling Concentrator: Styles one section at a time with concentrated airflow. 9ft. Cord with Cord Wrap: Professional-length cord for ease of use. *Results may vary by hair type. Do not wrap the power cord around the dryer as this may damage the electrical wiring. Consult the enclosed user guide prior to use.